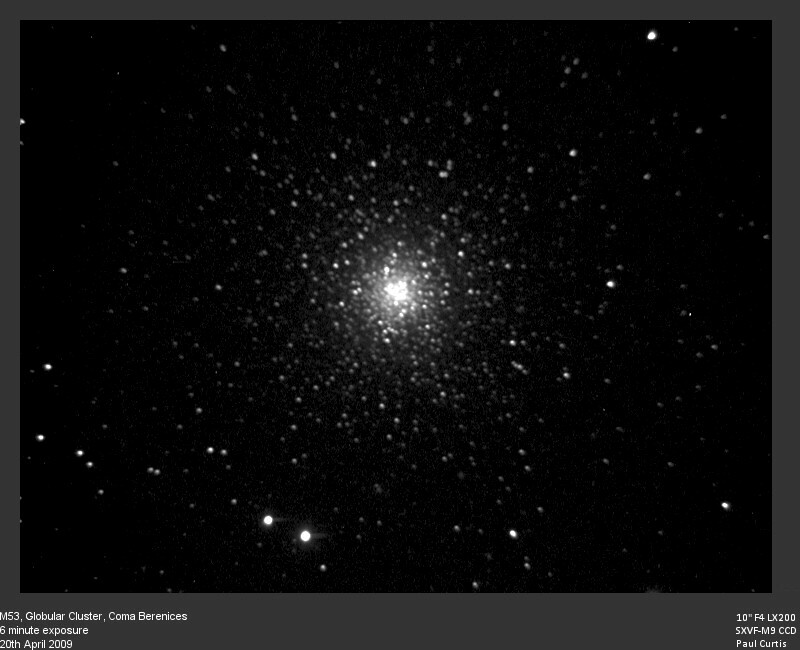 - 10" Meade LX200 SCT f6.3, Starlight Xpress Trius SX25C camera. 20 minute exposure. 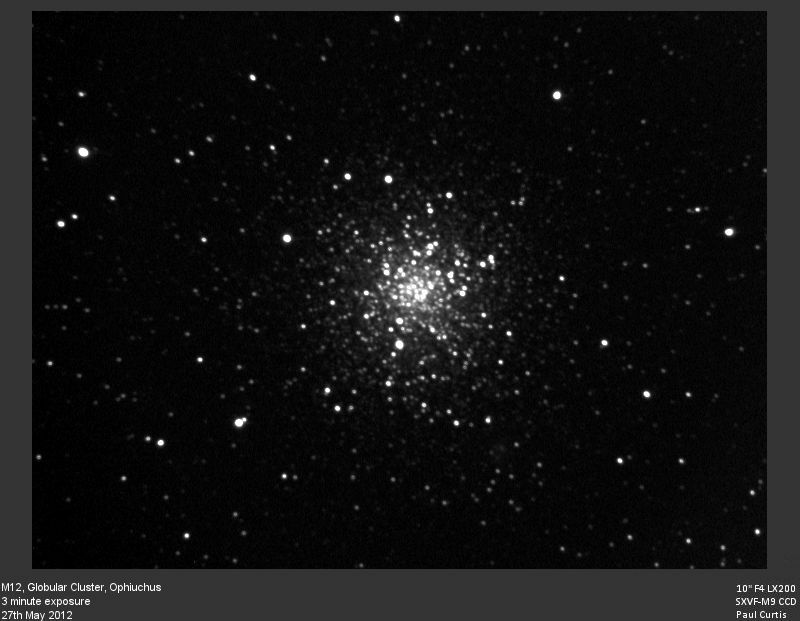 M13 Globular Cluster in Hercules, Mag 5.9, 16.6'. 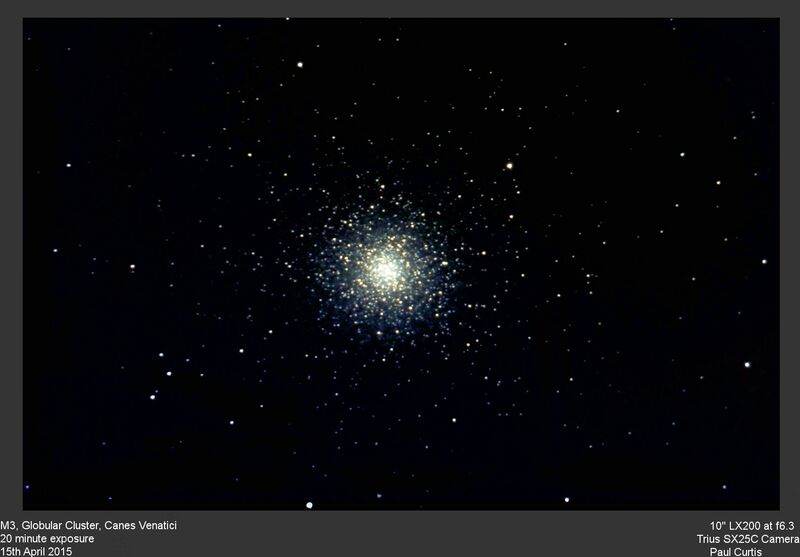 Best globular in northern hemisphere. Stars magnitude 11+. 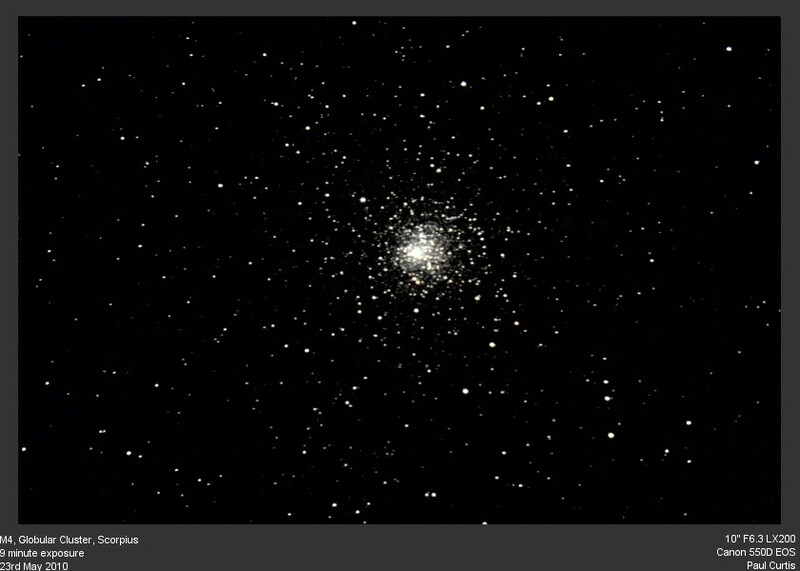 10" Meade LX200 SCT f4, Starlight Xpress MX9 CCD. Multiple exposures : Effective integration time 9 minutes. 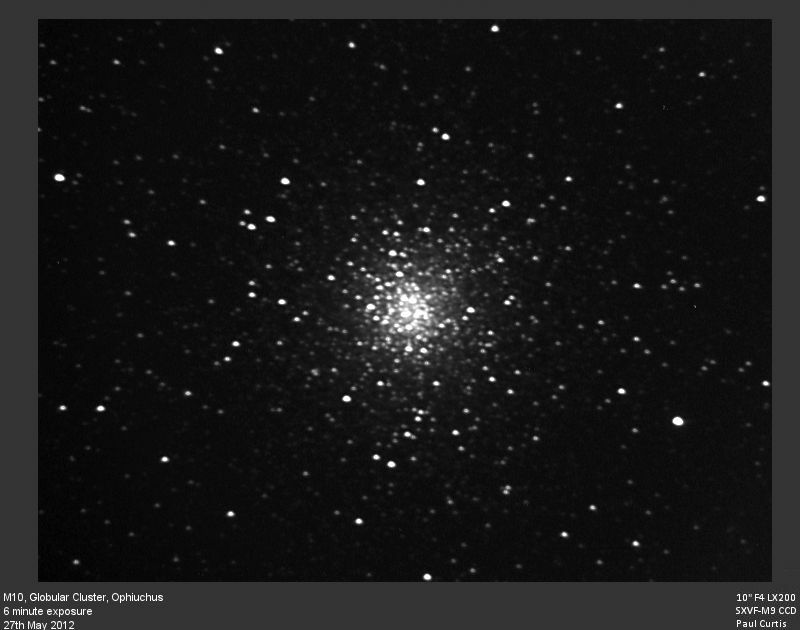 M22 Globular cluster in Sagittarius, one of the best. Mag 5.1, 24'. Stars magnitude 11+. 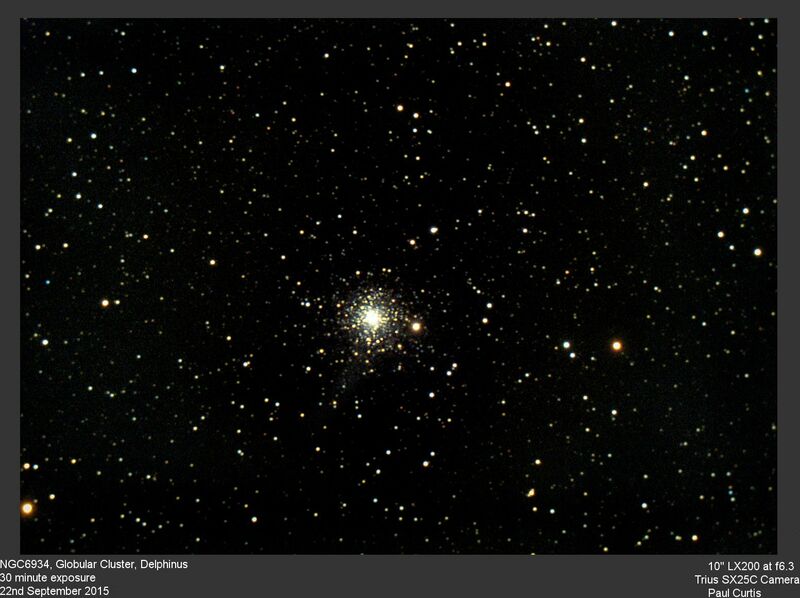 10" Meade LX200 SCT f6.3, Canon 550D EOS. 3 minute exposure. 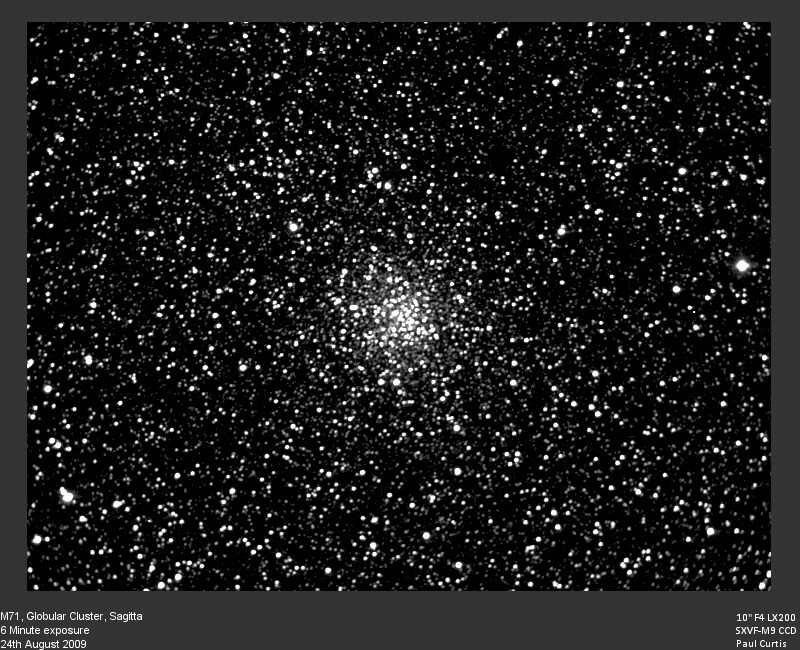 - 10" Meade LX200 SCT at f4, Starlight Xpress SXVF-M9 CCD. Exposure time 3 minutes. 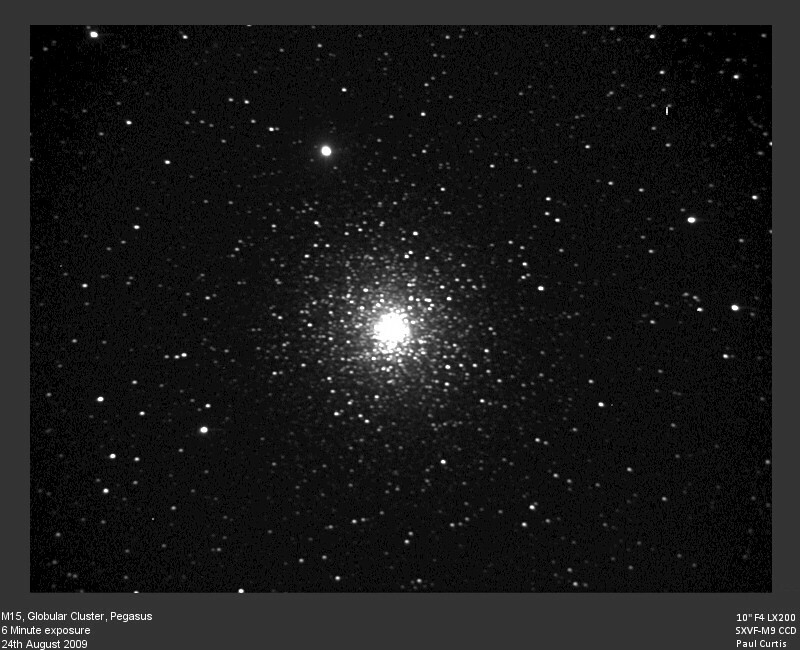 10" Meade LX200 SCT f4, Starlight Xpress SXVF-M9 CCD. Exposure time 3 minutes. 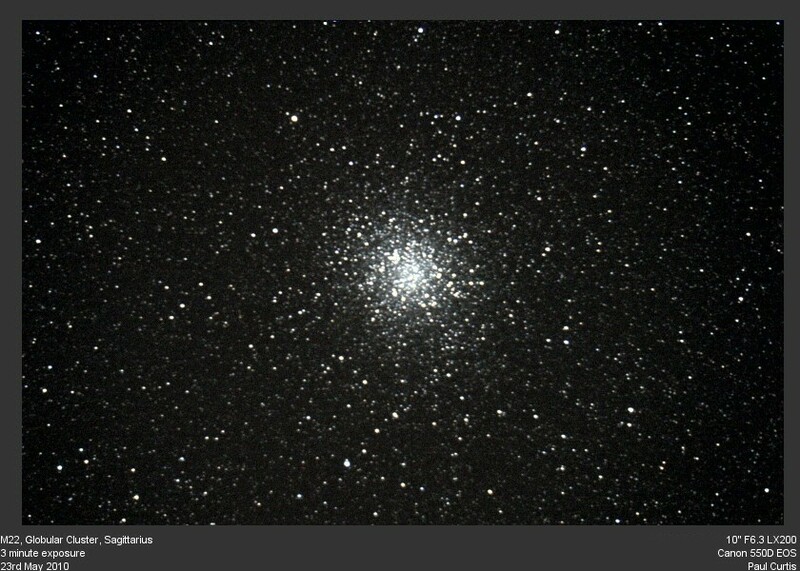 10" Meade LX200 SCT f4, Starlight Xpress SXVF-M9 CCD. Exposure time 6 minutes. 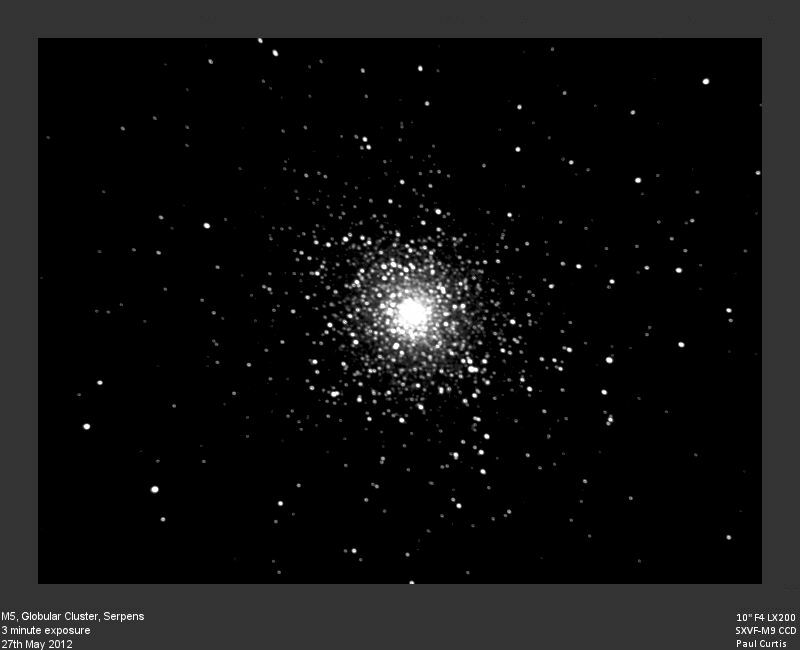 M4 Globular cluster in Scorpius, close to Antares, Mag 5.4, 36'. 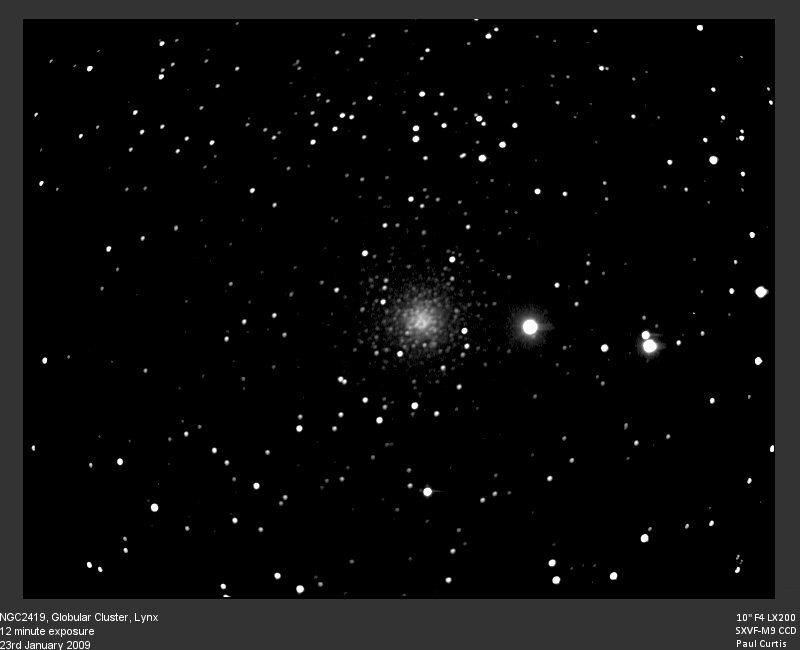 10" Meade LX200 SCT f6.3, Canon 55D EOS, Multiple exposures : Effective integration time 9 minutes..
- 10" Meade LX200 SCT f10, Starlight Xpress SXVF-MX9 CCD. Multiple exposures : Effective integration time 6 minutes. 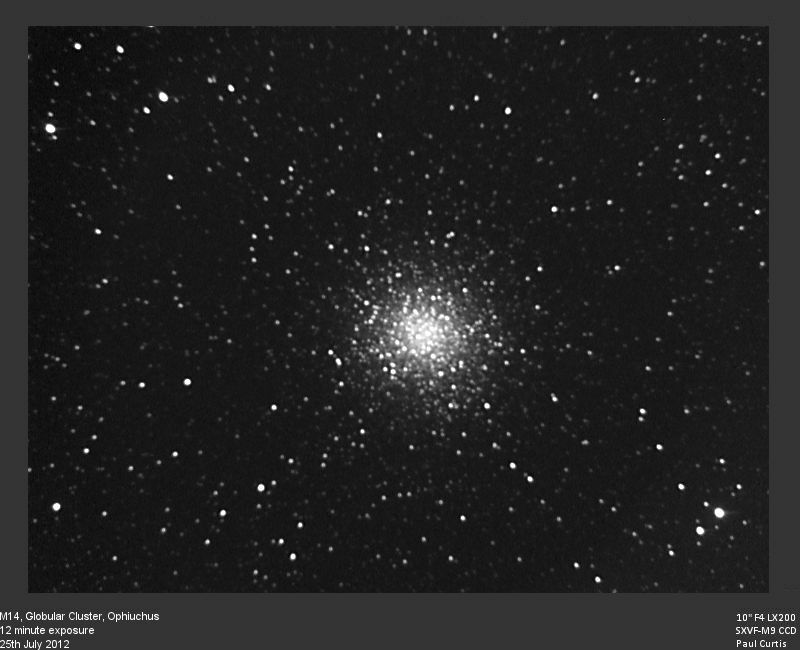 M14, Globular Cluster, Ophiuchus. 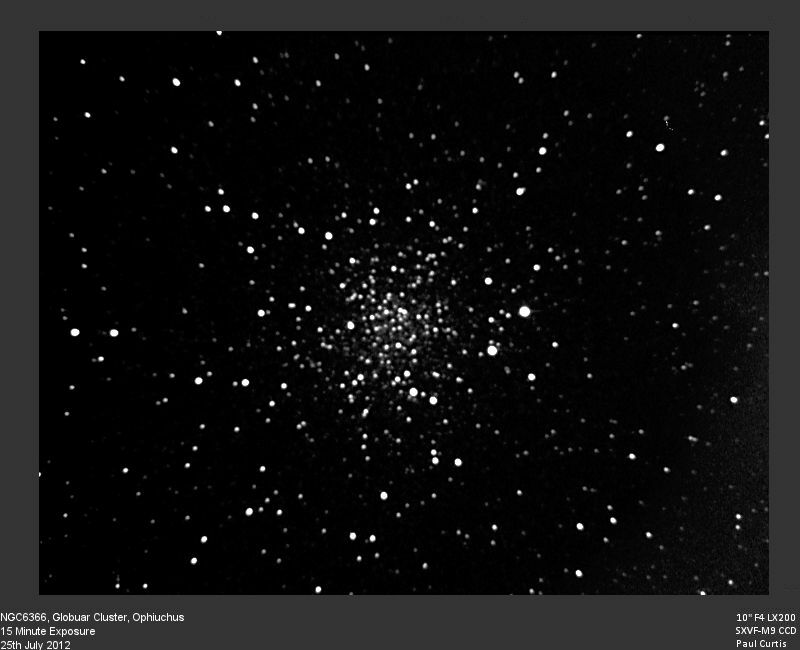 10" LX200 SCT at f4, Starlight Xpress SXVF-MX9 CCD. Effective exposure 12 minutes. July 2012. 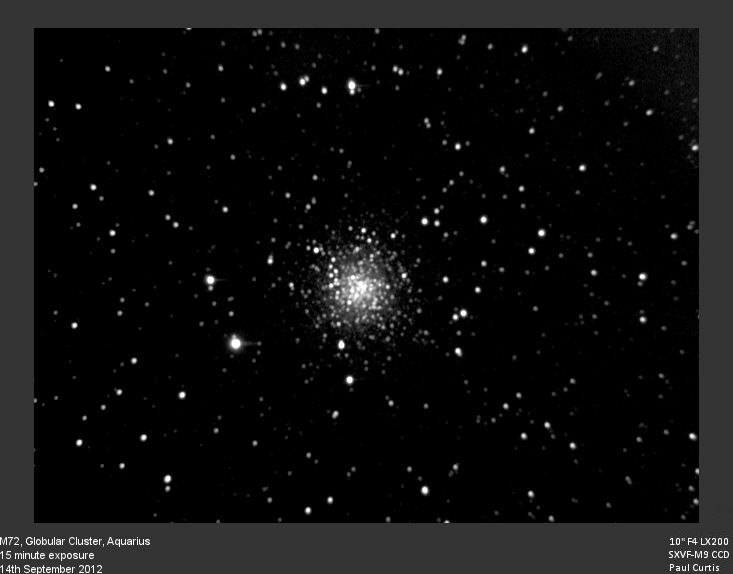 - 10" Meade LX200 SCT f4, Starlight Xpress SXVF-MX5 CCD. Six minute exposure. 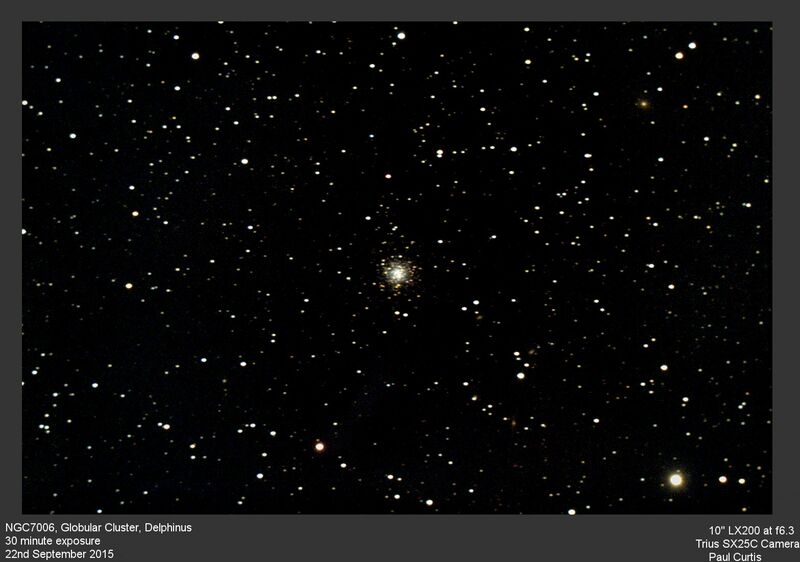 - 10" Meade LX200 SCT f4, Starlight Xpress SXVF-MX9 CCD. Multiple exposures : Effective integration time 9 minutes. 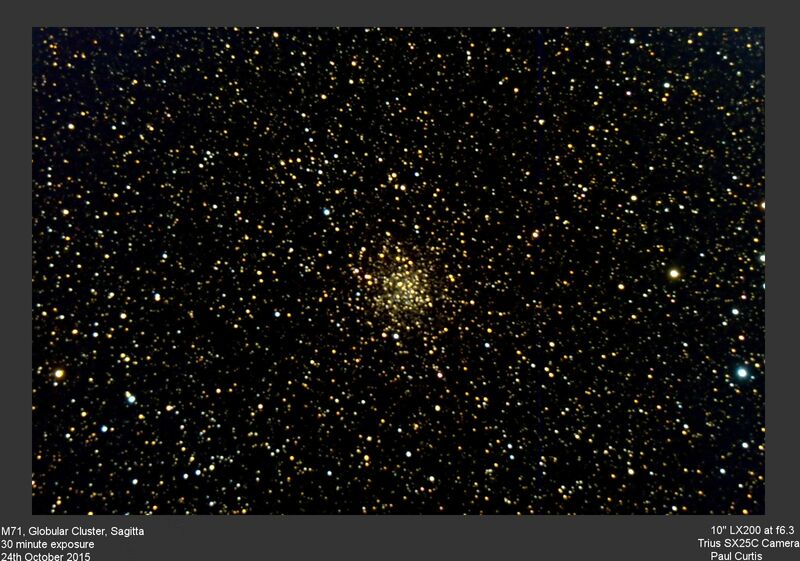 - 10" Meade LX200 SCT f4, Starlight Xpress SXVF-MX9 CCD. Effective integration time 15 minutes. 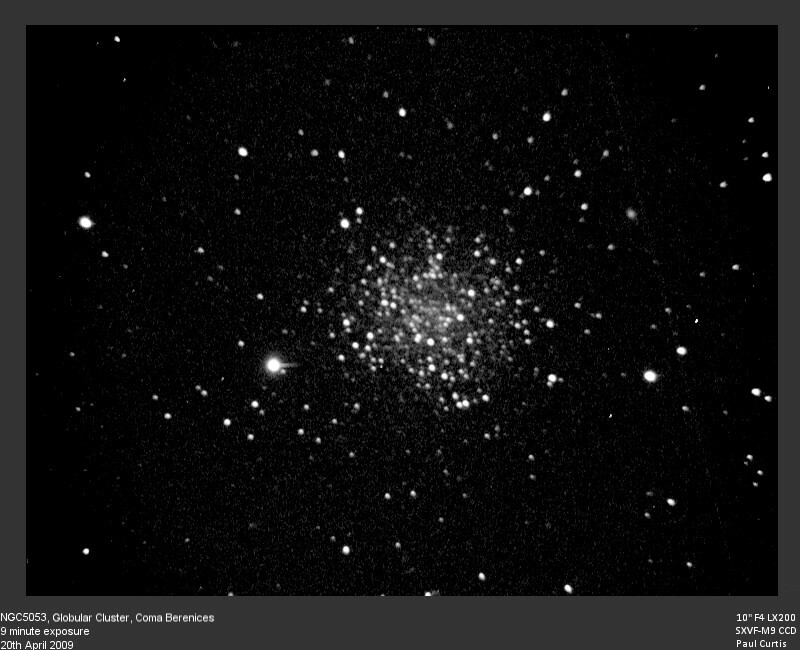 - 10" Meade LX200 SCT f6.3, Starlite Xpress Trius SX25C camera. Exposure 30 minutes. 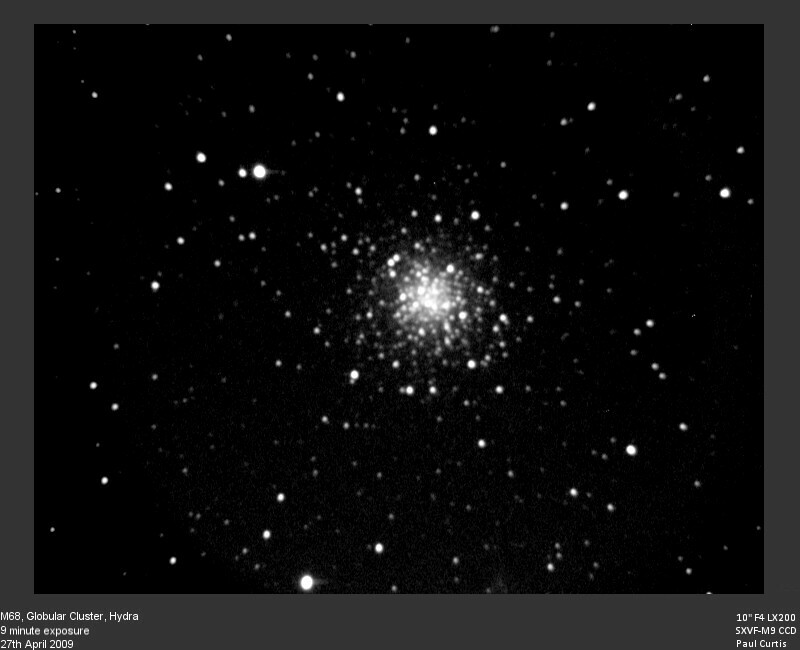 - 10" Meade LX200 SCT f4, Starlight Xpress SXVF-MX9 CCD. Multiple exposures : Effective integration time 9 minutes. 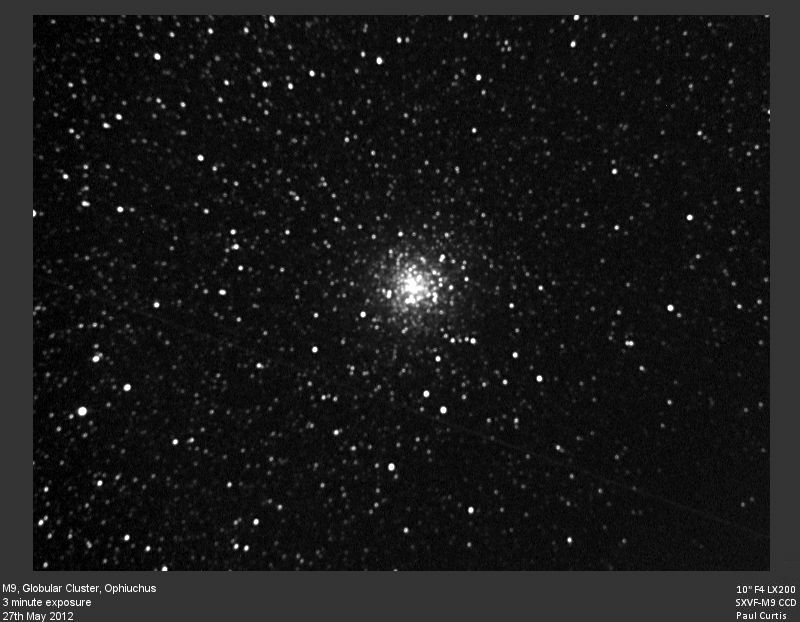 M30, Globular Cluster in Capricornus, Mag 6.9, 12'. 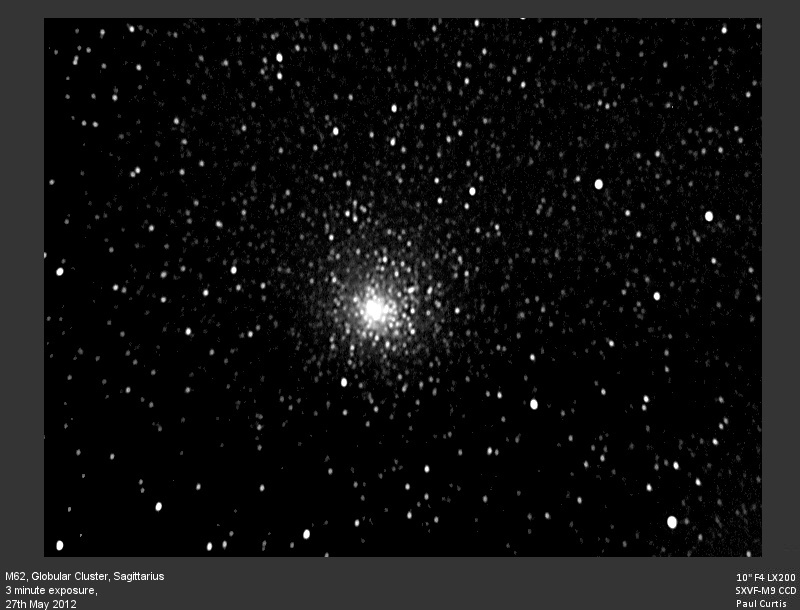 10" Meade LX200 SCT f6.3, Modified Canon 1100D, 8 minute exposure. 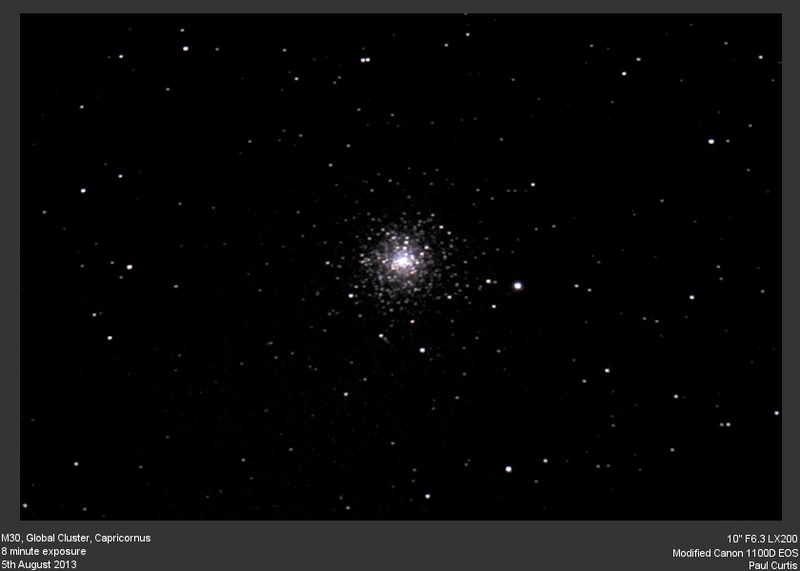 M62, Globular cluster in Sagittarius - 10" Meade LX200 SCT f4, Starlight Xpress SXVF-MX9 CCD. 3 minute exposure. 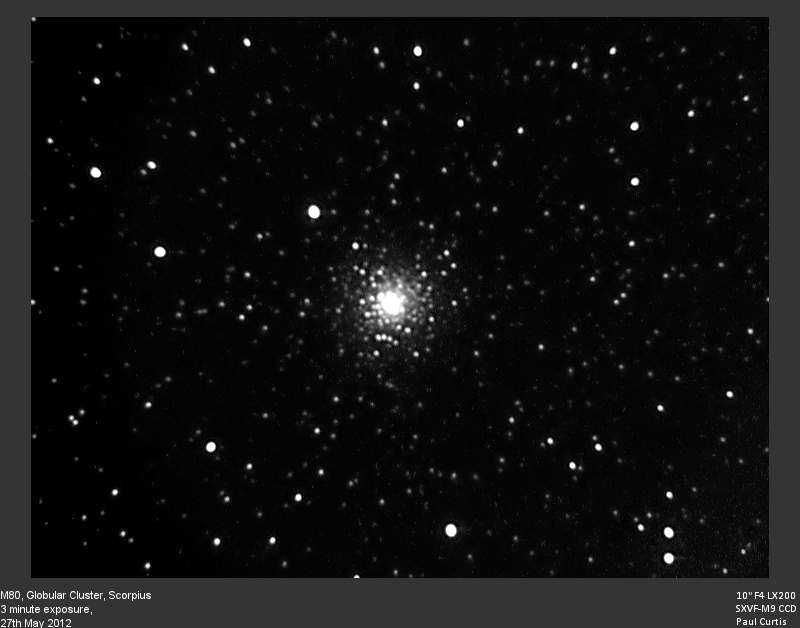 - 10" LX200 SCT f4, Starlight Xpress SXVF-MX9 CCD. Three minute exposure. 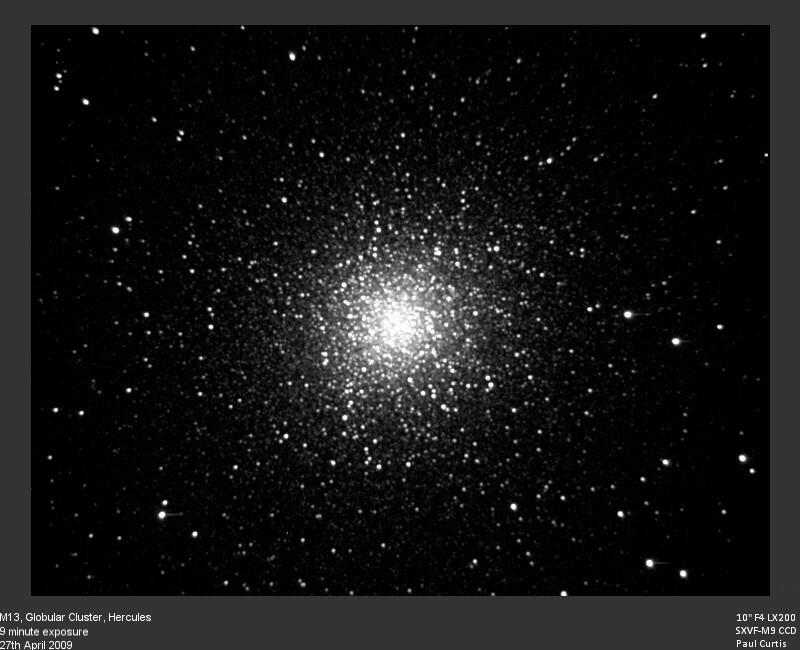 - 10" Meade LX200 SCT f4, Starlight Xpress SXVF-M9 CCD. Multiple exposures : Effective integration time 9 minutes. 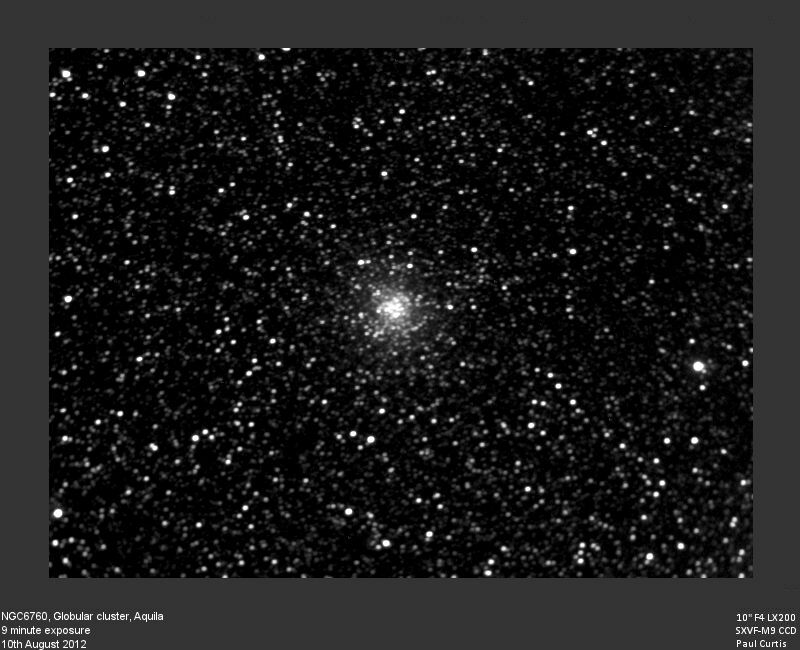 NGC6760, Globular Cluster, Aquila. 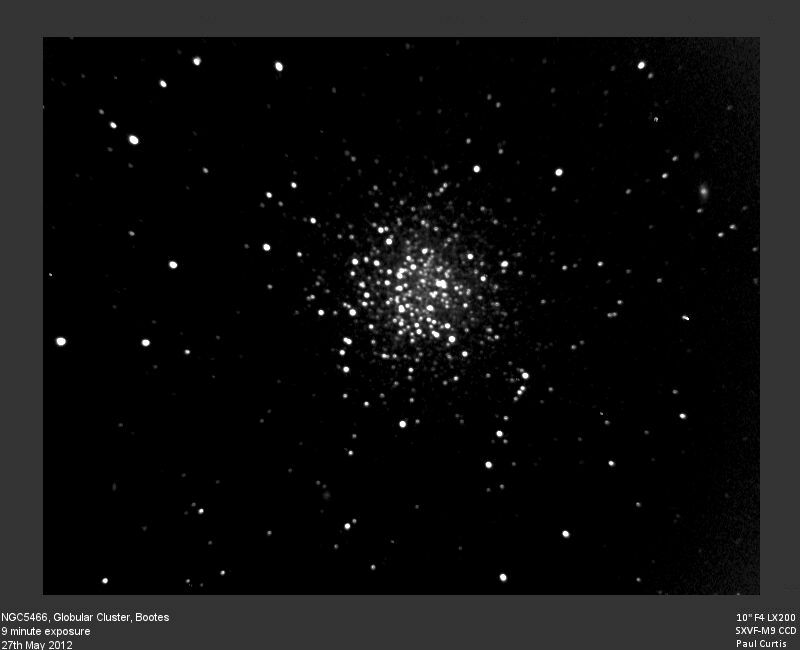 10" LX200 SCT at f4, Starlight Xpress SXVF-MX9 CCD. Effective exposure 9 minutes. August 2012. 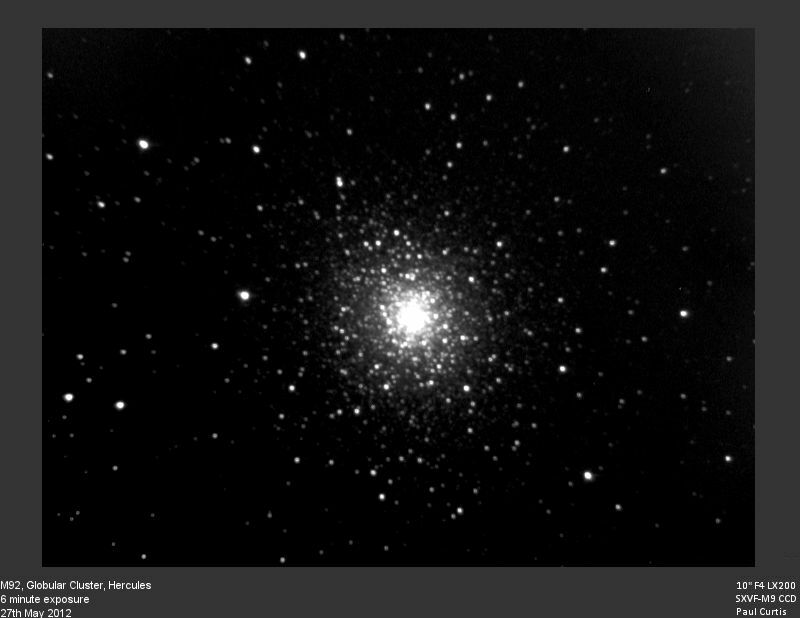 - 10" Meade LX200 SCT f4, Starlight Xpress SXVF-MX9 CCD. 15 minute exposure.